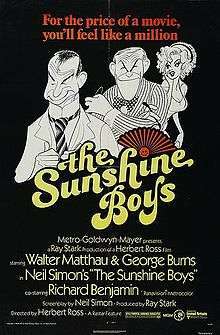 The Sunshine Boys is a 1975 American comedy film directed by Herbert Ross and produced by Ray Stark, released by Metro-Goldwyn-Mayer and based on the play of the same name by Neil Simon, about two legendary (and cranky) comics brought together for a reunion and revival of their famous act. The cast included real-life experienced vaudevillian actor George Burns as Lewis, Walter Matthau as Clark, and Richard Benjamin as Ben, with Lee Meredith, F. Murray Abraham, Rosetta LeNoire, Howard Hesseman, and Ron Rifkin in supporting roles. This would be Matthau's last Neil Simon movie until 1982's I Ought to Be in Pictures with Ann-Margret and Dinah Manoff. Woody Allen originally was asked to direct, but he was more interested in playing the role of Lewis and declined the offer. Twenty years later, he would be cast as Lewis in the 1996 television adaptation. Initially, Bob Hope and Bing Crosby were proposed for the leads, but Simon was opposed to the idea, as he felt the roles required Jewish comedians. Several actors, including Groucho Marx and Phil Silvers were considered and the roles eventually were given to real-life vaudevillian veterans Red Skelton and Jack Benny. Benny was forced to withdraw after being diagnosed with the pancreatic cancer that would soon claim him and recommended his friend and fellow real-life vaudevillian veteran Burns for the role, who had not been in a film since 1939. Skelton declined after realizing his income was higher performing his stand-up comedy than what he was offered for the film; he was replaced by the younger Matthau. Burns' Academy Award-winning role revived his career and redefined his popular image as a remarkably active, older comedy star. Al Lewis (George Burns) and Willy Clark (Walter Matthau) are two old comedians who were once a popular vaudeville comedy act known as "Lewis and Clark" and also called the Sunshine Boys. After 43 years together, they parted ways 11 years ago on unfriendly terms and have not spoken to each other since then. The break-up was due, in part, to Al's intent to retire and Willy's desire to continue performing. Willy's nephew, Ben (Richard Benjamin), a talent agent, tries finding work for Willy, which proves difficult due to Willy's age and blustery temperament. When one of the major networks decides to air a program on the history of comedy and wants the Sunshine Boys to reunite for the show, Ben tries securing the duo's cooperation one last time. Ben tries managing the individual quirks of two old men in their twilight years, including omitting the abuse and insults each used in discussing the other with him, and diplomatically portraying each as anxious to do the "Doctor Sketch" for an ABC special to give the appearance of harmony. An attempt to rehearse the Doctor Sketch at Willy's apartment starts with the two grudgingly getting re-acquainted, but goes only as far as Al entering the doctor's (Willy's) office, before Willy decides to change the scripted long-established "Come in" to "Enter!" This results in a loud shouting argument and Al's stormy departure. Ben has to patch up and salvage the situation, despite the objections of Al's daughter to her father being bothered any more about the special and manages to get them in the studio. In the dressing room, they do not speak to each other as persons, just like they did in the last year they did their sketches. There is unpleasantness when Willy carelessly dumps makeup jars on Al, followed by Willy's usual trouble with doors, in the dressing room. After Phyllis Diller finishes her scene and Steve Allen speaks his introduction, the Doctor Sketch starts. It flows smoothly until Willy starts shouting about Al's spitting on him and poking him in the chest. Despite Ben and the staff trying to restore order, Willy finally storms off the set, shouting accusations and abuse, and Al also leaves (finding it impossible to work with the man). In the stairwell, Willy's ongoing temper tantrum results in him being felled by a serious heart attack. Willy recovers, first in the hospital and then at home with a private nurse, with whom he argues. Ben visits and tells him that he has to retire now. He has in mind an actor's retirement home. Al is also going to move into the same retirement home, as his daughter is going to have a baby, and she will need his room. The two meet again at Willy's apartment, in attempts to finally establish a friendship. ↑ ""The Sunshine Boys" – 1995". Retrieved December 22, 2006. 1 2 "PovOnline". Retrieved December 22, 2006. ↑ "Film Threat's Top 10 Death-Denied Roles". Retrieved December 24, 2011. ↑ "NY Times: The Sunshine Boys". NY Times. Retrieved December 30, 2008.